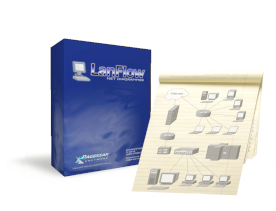 LanFlow is an easy-to-use, feature-rich, LAN and computer network diagramming tool for Windows. With LanFlow you can design, plan, and document your computer and communications resources. LanFlow can create network diagrams with minimal effort. You can become productive immediately with no prior training. You can create network diagrams in a very natural intuitive way. Most tasks can be accomplished in multiple ways so that the way you prefer is usually available and does what you expect. This attention to your convenience and productivity is reflected throughout the product. Drop in components like computers, workstations, and servers and then connect them with various types of lines and cables. The diagram model is very simple. Add the network elements you want, connect them with lines and cables, add descriptive text. The program does the rest by keeping lines attached properly, and managing associations between shapes, lines, and text. Includes several pre-defined diagram templates with each style of symbols. Hyperlinks let you link symbols to other diagrams, web pages, or documents. 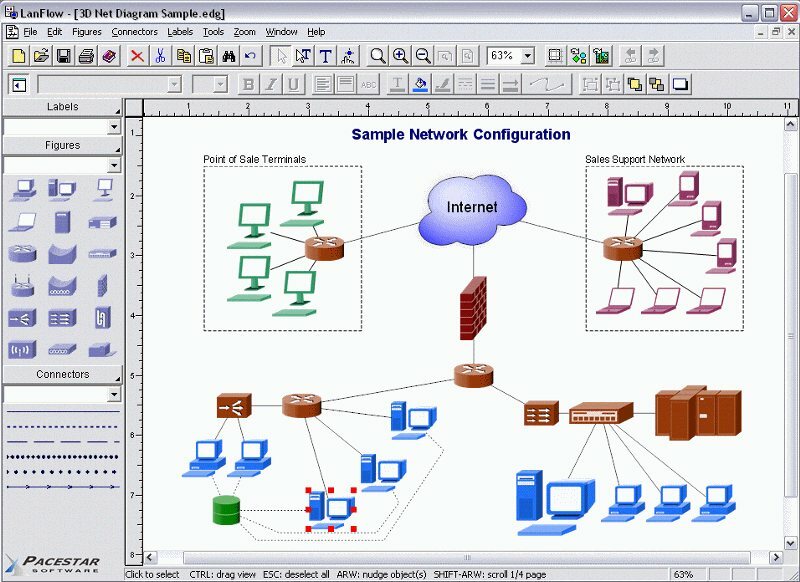 Simply link any figure to another diagram and open that diagram by double-clicking on the figure. You can also link a figure to a web page, a spreadsheet, a database file, or any other document. Complete online help plus optional PDF user guide. LanFlow includes a variety of symbols that represent the most common networking devices either symbolically or as recognizable facsimiles of hardware components. 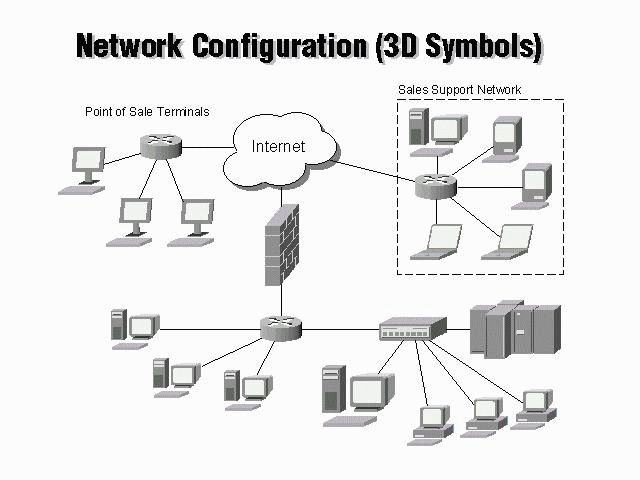 The standard components include symbols for such things as computers, printers, servers, routers, hubs, bridges, phones, modems, gateways, directors, repeaters, cables, wiring, and more. Symbols are available for use individually but they are also organized into templates or symbol sets. Symbol sets are available in several different styles to suit a range of different diagramming purposes. Simple outline symbols (see example to right) are ideal for diagrams that require high performance and small storage size. Outline symbols are native to the software (in other words they do not require external artwork) so they are the easiest to customize. For example, you can change the fill color and border color of any shape, adjust the border thickness, and add descriptive text of any font, size, and color as part of the shape. 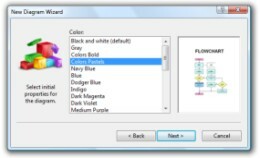 Other symbol sets include attractive three-dimensional symbols based on coordinated clipart images rather than outlines. These symbol sets can be sized and arranged any way you like but attributes like fill color and line widths are pre-defined for artistic effect and cannot be customized. The "presentation" symbol set used to create the sample on the left contains 3D grayscale graphic symbols ideal for presentations and proposals that require a highly refined professional appearance. The "documentation" symbol set is identical to the presentation set but in black and white. These symbols are especially useful for documentation that will be printable on standard black ink and low resolution printers. 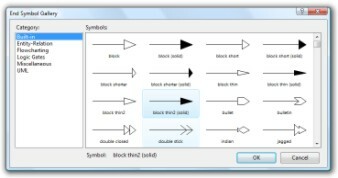 LanFlow's 3D symbol sets are similar to notation used by Cisco Systems in their documentation and course material for their Cisco Career Certification Program (for example see the book "Designing Cisco Networks", Cisco Press). Cisco Systems is widely recognized as the global leader in networking for the internet. As industry leaders, the notation they choose certainly qualifies as a de facto industry standard. Our unique symbols are well-suited for expressing and extending this standard notation. Connectors (lines) connect symbols within your diagram. In network diagrams lines usually represent cables. You can control all aspects of a line style including color, thickness, line pattern, curvature, terminator symbols, and flow symbols. The New Diagram Wizard makes it easy to select from a range of diagram sizes in a single step without the need to create a custom diagram template. It also provides a simple mechanism to change a diagram's font and text size throughout the entire diagram. Use of the wizard is optional. Attach and detach from flows: Easily add and detach symbols to and from a "flow". A flow is a sequence of steps in which cables connect one symbol to another. Simply drag a symbol over the connector and drop it into the flow. New connectors will form to accommodate the symbol. You can later detach the symbol either explicitly or by simply deleting it, and the flow will return to the way it was. 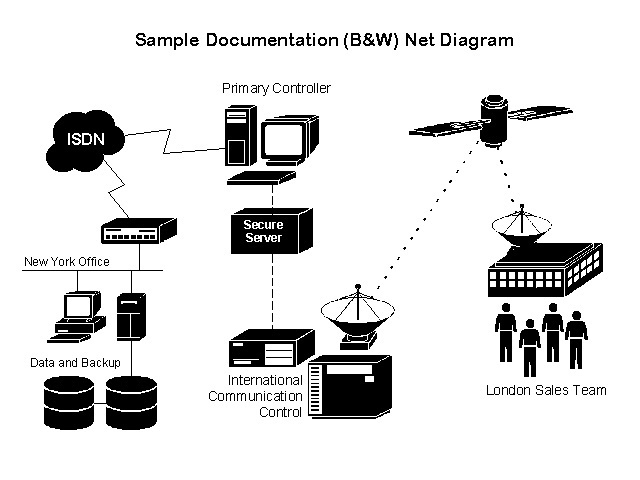 LanFlow also includes the capability to add all forms of block diagrams, flowcharts, and design notes within your network diagrams. 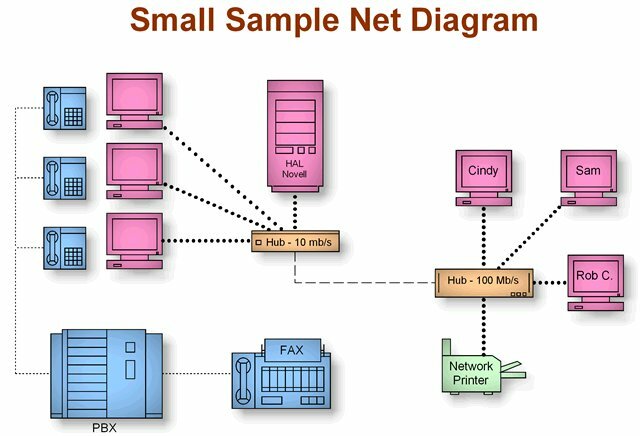 Each network diagramming template includes a collection of shapes and arrowheads that you can use to annotate, document procedures, describe processes, and add information.